It seems something of an anti-climax, on the day when so many flog themselves round 26.2 miles in the Great Wen, to boast of four-and-a-quarter miles, but it's all I have to report. It was hard, but I'm not sure to what extent that was because of the Brighton marathon a week ago, or to be attributed to yesterday's swimming coaching, a taxing stamina session. The run itself was over a familiar, short route, to the Cuckmere and back by way of Hope Gap and Seaford Head. I thought of a remark I meant to make about last Sunday: in that pre-race heightened state of awareness that every runner will know, about how the hours before the race were like being in love, that every piece of music from Radio 3 on the car radio seemed to have been chosen for an esoteric significance to my situation. For the record, these were Butterworth's Banks of Green Willow, Debussy's La Cathedrale Engloutie, Beethoven's overture Die Weihe des Hauses and the last movement of Mozart's Clarinet Quintet. One day I may explain why these works speak to me so clearly, and I may find I reproduce this pattern of music before future marathons. 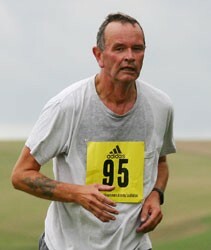 I may also include the Seaford half marathon, and the Bewl 15. Juneathon looms menacingly. In the longer term, the next marathon will be the Three Forts in 2013. As I write this post, I am following the tweets from the Classical Association conference, where Professor Chris Carey, with the aid of Percy, a teddy bear dressed as a gladiator, is giving a plenary lecture on Ancient Athletics. See #CA2012 if you're interested. Last night I ran for the last time before Sunday, three miles through fields of lambs. Today I drove from one meeting to another along the seafront and looked over at Shoreham power station. For all the mythology that has grown up around that stretch of the course, when I look at the map I see that it is only about three miles in total. I worry about the weather: the northerly wind is going to make it cold, but not so cold that I need to wear anything more than my running vest. It's hard to think of anything but the marathon; I fear I may not be at my most productive. An unexpected e-mail has just come from a fellow Strider, out of running through injury. He urges me, if it gets tough, to think of it as another training run. 'Above all, enjoy it', he says.' I have a feeling you will.' Good advice, which I will heed. This is the last week, and every entrant for Brighton must be in a similar state of mind. In the day job, as a medical librarian, I found myself looking at a database subject heading for castration anxiety. Shoe anxiety: should I wear the very worn pair, which has seen me through all my long runs, or the faster, newer but less comfortable ones I wear for road training? Buying new ones is, naturally, out of the question at this late stage. Suppose my cats eat my shoelaces the night before the marathon? Weather neurosis: will it be hot, like last year, with exhausted runners carted off in wheelbarrows? Or wet and windy like last weekend? What if aliens invade and take us all off to their galaxy, to farm us as we farm cattle and swine? What if I wake, turned like Joseph K into a giant insect? What if the road collapses and we all fall into a sewer and drown? Some of these fears can be planned for; for the others, I can do nothing about, so it is not worth worrying. As for castration, it is, I hope, unlikely. I ran with the Striders on Wednesday evening. As the evenings lighten, the possibilities of running off-road begin to increase again. We meet, hear brief words from our captain, Martin, form ourselves into groups, and get out quickly to make the most of the light. It's pleasing to see fellow runners progressing, moving up to join faster pace groups, though I stay with the slow-to-mediums. We ran up over Seaford Head, to Hope Gap, back towards the Golden Galleon and up the hill we have dubbed Sheep Hill. It was a glorious evening, offering fine prospects of the Seven Sisters and we managed most of the course in daylight. I felt puissant, running well on the ascents. There are few runs left before Brighton. Nevertheless, with an old friend's funeral to attend the next day, I could not help thinking that I, and every other runner there, has only a finite number of runs left. So we must make the most of them. The funeral meant no running today, but tomorrow there is the Good Good Friday Run. The hills first: early this morning I ran up and down bits of Seaford Head, for a hill session, as the sun came up and light spread. It was cold at first, but running uphill warmed me up very quickly. There's something very agreeable about the pattern of interval running on hills, the hard slog up, and the gentle trot down, over and over again. I could not say I could carry on forever, though. It is taxing stuff. So much for that; far more exciting news is that today a podcast, in which Julia Armstrong talked to me, went live. Julia has recorded eighty-one of these to date, with far more illustrious runners and artists than me, and I urge you to explore the archive. So wide is her choice of subjects that everyone will find something to listen to with interest. Recording the podcast, on a beautiful afternoon last week, was a pleasure. I felt no nerves, unlike most interviews, when I identify strongly with the little cavalier boy in W F Yeames' When did you last see your father. Talking to Julia and Andrew (aka @DoctorPod) was easy, even for a diffident conversationalist like me, and I wished we could have gone on all afternoon. From running we strayed to cover sailing, poetry, our relationship with the natural world and more. Do listen. The big question for today's long run was what, or more exactly, how much, to wear. There was a chilly wind, so I wore a t-shirt covered by a long-sleeved top, with the sleeves pushed up. I was more or less the right temperature throughout the sixteen miles. The hero of the day was the shirtless runner I passed between High and Over and Fiveways. Sir, I salute your fortitude. For much of the rest of the run I passed a number of walkers and runners, all clutching maps. They must have had a staggered start, for walkers and runners were intermingled. I asked what it was and was told it was a challenge walk. With two weeks to go, I feel in good shape and spirits. I see that Sweder will keep his morale up by imagining his wife holding a pint of Harveys aloft at the finish. I must find a similarly motivating mental picture for my own use.